Maximalism – An Emerging Design Trend? Apparently the Great Recession is coming to an end. After years of spending carefully, there is pent up demand for home improvement projects of all kinds. Along with this seems to be a desire for luxury and lasting products that will add to our lives with beauty and durability. Some have mentioned that Maximalism is a design trend of the future in response to the frugality of the recent past. Do you agree? Have you seen hints of this trend emerging? Maximalism offers style without clutter using luxury materials. Texture is important and often there is a layering of texture and pattern or the use of multiple patterns. Colors are often rich, bright and bold with detailed room accents and luxe touches like crystal pendant chandeliers. 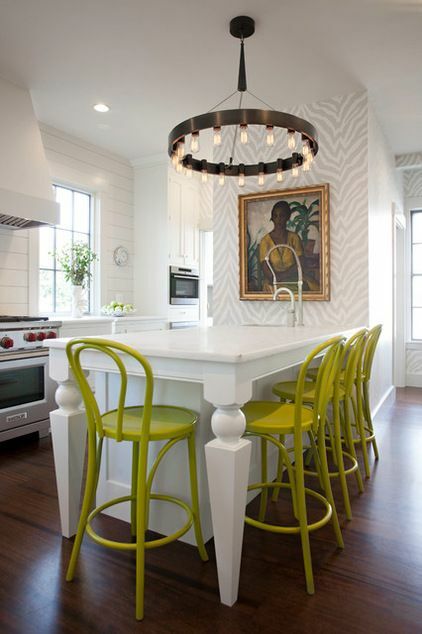 There are traces of Maximalism in the kitchen above found on Houzz. How can we institute Maximalism details in our kitchen and bathroom designs? Share pics of ideas! Reclaiming and repurposing are out with Maximalism. Is this an issue? What are your thoughts on this? Do you think Maximalism is an emerging design trend? on Wednesday, July 16th from 2 to 3pm eastern time! Here is the transcript for this KBribechat. Fascinating topic, really; my question is: how did those who went through the original Great Depression of the 1930s react once the economy recovered? I feel like there was still a fear that caused them to hold on to things, recycle, reuse, etc. It looks like this trend seeks to still keep things minimal in a way, but using maximum funds to do it. Am I on the right line with that thinking? Thank you Kitchen Gallery. This trend is more about the desire for quality products that will stand the test to time. Kitchen design in the 1940s is an entirely different topic. Hope you can join our Twitter discussion on Wednesday! Interesting observation! This will be a very interesting discussion. Looking forward to what our community has to say on the topic! Hope you can join us on Wednesday.